Keep summer fun going with outdoor activities that encourage creativity and independent thinking. School is in session, but that doesn’t mean outdoor summer fun has to stop. Sure, going back to school might mean the long summer days of riding bikes and playing hide-and-seek outside will be replaced with classrooms and school bells, but kids can still find time to play in nature when they aren’t in school. And the good news is that outdoor play time has many benefits; a growing body of research shows that nature play encourages creativity and problem solving, boosts academic performance, helps people focus, reduces stress, and promotes positive social relationships. Sharing discoveries—like water creatures from Garden lakes—is a great way to cement knowledge. British sculptor, photographer, and environmentalist Andy Goldsworthy inspired this nature art at Camp CBG. Create land art. 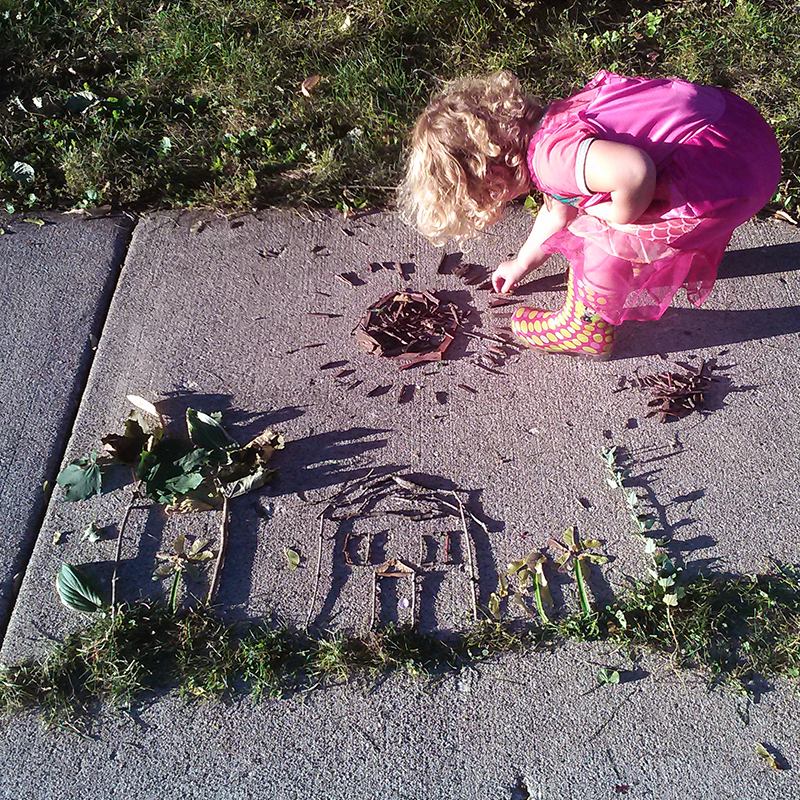 Use twigs, rocks, and leaves to create artistic sculptures and let creativity be the guide. Build a stone tower topped with a flower, or let a design naturally reveal itself. Discover the beauty of natural materials and make whatever feels right. There are no limits on what can be created using material found in the backyard and a bit of imagination. Half the joy of painting with mud: mixing your colors. Paint with mud. Why use regular paint when mud is so much more fun? Swap out watercolors for mud and ditch brushes for hands to create all-natural art. Take sustainability up a notch by using an outside surface—the sidewalk, a driveway, or back patio—instead of paper as your canvas. Wash creations away when you’re through. Dissect flowers. Pick a few wildflowers and take them apart. Examine each petal and stamen. Compare different flowers and notice the shapes and colors of each. For older children who are interested in art, use the dissected flower pieces to make geometric patterns. Budding scientists can compare different kinds of flowers to learn more about what attracts certain pollinators. Peeling apart leaves, seeds, and flowers reveals all kinds of interesting information about the natural world. Go on an adventure hike. It seems obvious to suggest a hike when talking about activities that can be done outdoors. But an adventure hike makes the walk more fun. Give the hike a theme and try to hunt for on-topic items. The theme can be a color (things that are blue), a shape (look for circles), or whatever else you think might be fun. Turning the hike into an adventure means children will be more aware of what’s all around them and will stop—maybe even literally—to smell the flowers. Study the clouds. Look up. A cloudy day provides an opportunity to find inspiration in the sky. Younger children can look for different shapes. Older kids can discuss the different types of clouds and identify those currently over their heads. The best part about this activity? No tools required. Can’t get enough nature play? Check out the new Regenstein Learning Campus and sample some of the Garden’s educational offerings at the Opening Weekend celebration on Saturday and Sunday, September 10 and 11, from 10 a.m. to 4 p.m. You can get artistic with a photography or mosaics class demonstration, stretch your muscles with yoga or tai chi, or have some fun running on rolling hills or splashing in the water of the Nature Play Garden. As a mom and working artist, I try to think of ways I can introduce my 3-year-old daughter to the outdoors and the power of imagination through craft projects. And as an employee at the Chicago Botanic Garden, I am inspired by all sorts of family programs and drop-in activities for kids and families that celebrate the outdoors. What’s fun about nature art is that it starts with an adventure and ends with a surprise. For instance, the “family of owls” that we created may appear in story time later. Here are some of the nature-inspired activities and kid-friendly crafts that have come out of my journey as a mother and continue to get the best reviews from Laila, my toughest little critic. 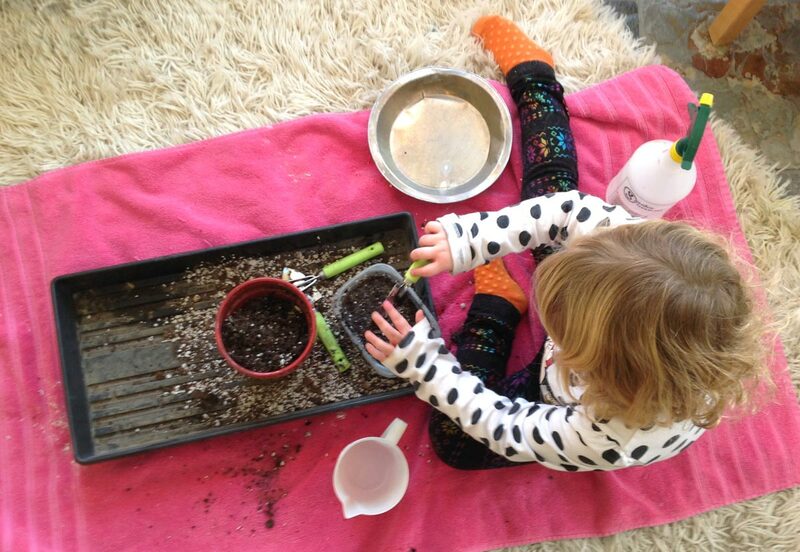 Even when she was a baby, my daughter was intrigued by dirt. She is still fascinated by it, in any form. In the long winter, when we’re tired of being cooped up, we bring a little of the outdoors inside and put together a mud pie prep kitchen. Supplies include dropcloth, potting soil, spray bottle, pouring cups, pie plates, and sticks, rocks and/or sand for decorating. Don’t forget to have an old towel underneath your creation station. 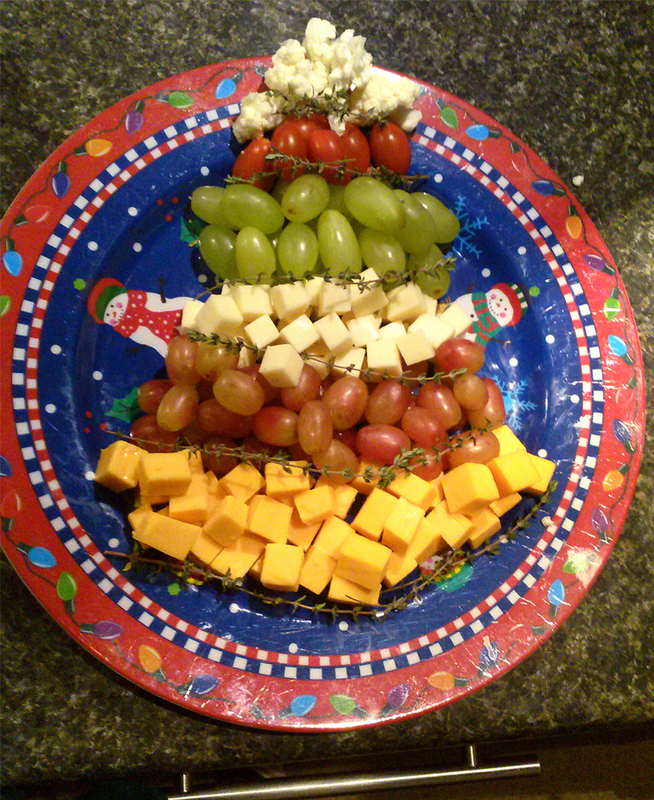 This is the best way to distract a picky eater, or wow guests with an inexpensive dish you can design with your kids. Laila and I made these creations out of various fruits, vegetables, herbs, and cheeses. Bite-sized holiday snacks are great for kids who graze. 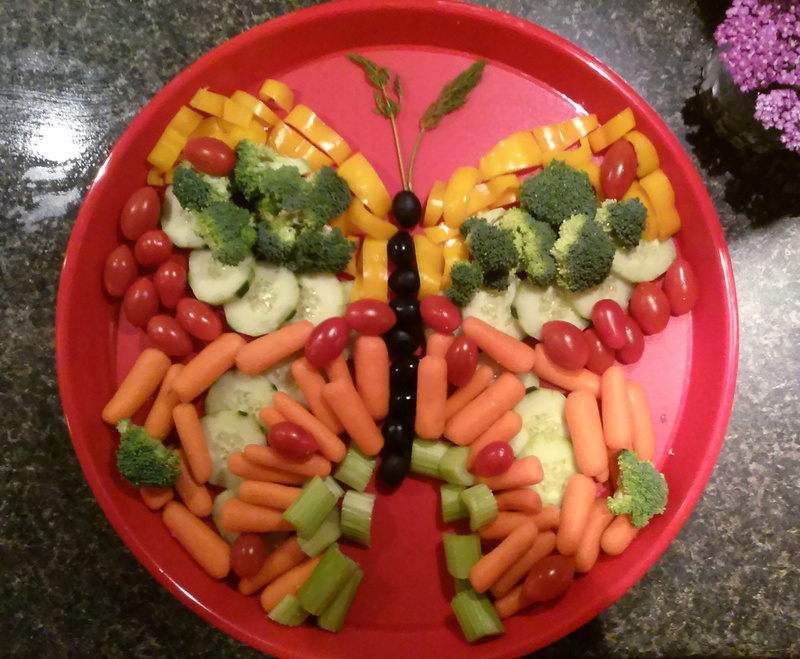 A vegetable butterfly makes for delicious, healthy snacking. Laila and I start by taking adventure walks and filling our pockets or a basket with sticks, leaves, flowers, and other found art objects. Everywhere you look, there are free art supplies. Every season has something outside to explore. We made a portrait of our house. Sticks and grass set the scene; Laila works on a mulch-made sun. Take gatherings inside to make nature scenes or collages inspired by the seasons. 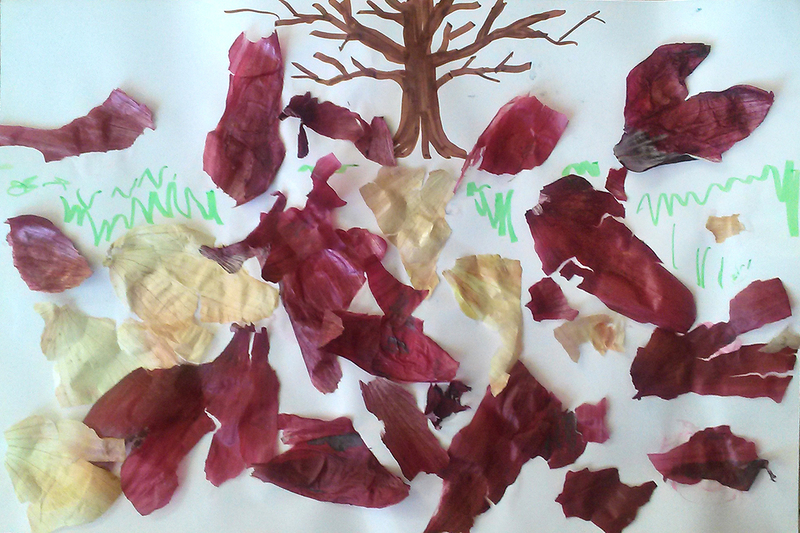 Here, onion skins provide the fall leaves for our tree painting. Hand-picked rocks can be collected, cleaned, painted, and polished to transform into precious stones with a story attached. Even little nature lovers can apply homemade or washable paint to their rocks before an adult adds a clear topcoat finish. The rock art can be used as a paperweight or embellishment to a potted plant. 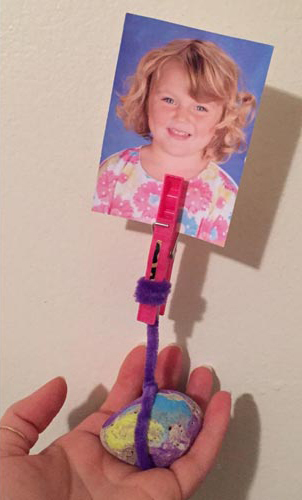 Add a pipe cleaner and clothespin to make it a photo holder. Every child likes to collect rocks. 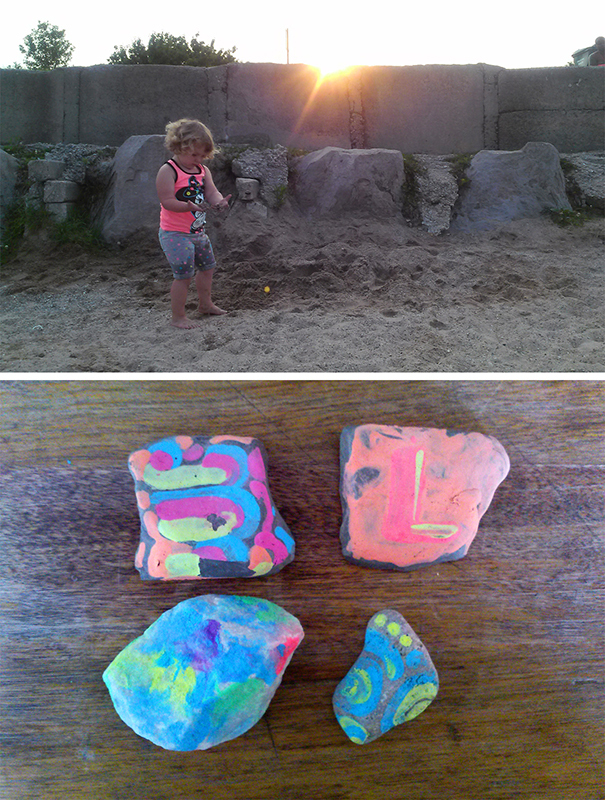 Collected stones can be painted or polished as keepsakes. Here, we’ve added a pipe cleaner and clothespin for a photo holder. One day we found pine cones and added fabric, buttons, and ribbon to create a family of owls that found a new home in our Christmas tree. Another time we used sticks, wire, glitter, and beads to build a twinkling mobile. 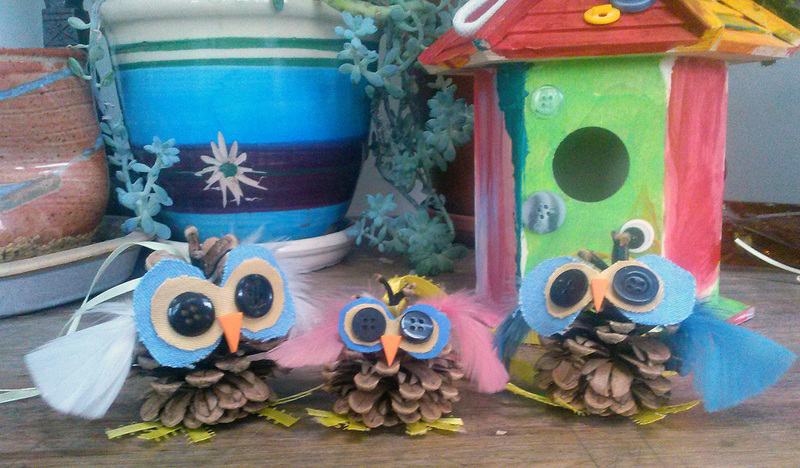 A family of pine cone owls made great Christmas ornaments. When the projects are done, we talk about what we made, where our supplies came from, and who we can share our creations with. Some of my favorite childhood memories are of outdoor exploration with my mom. I hope Laila someday will feel the same way. Want to get more nature into your child’s education? 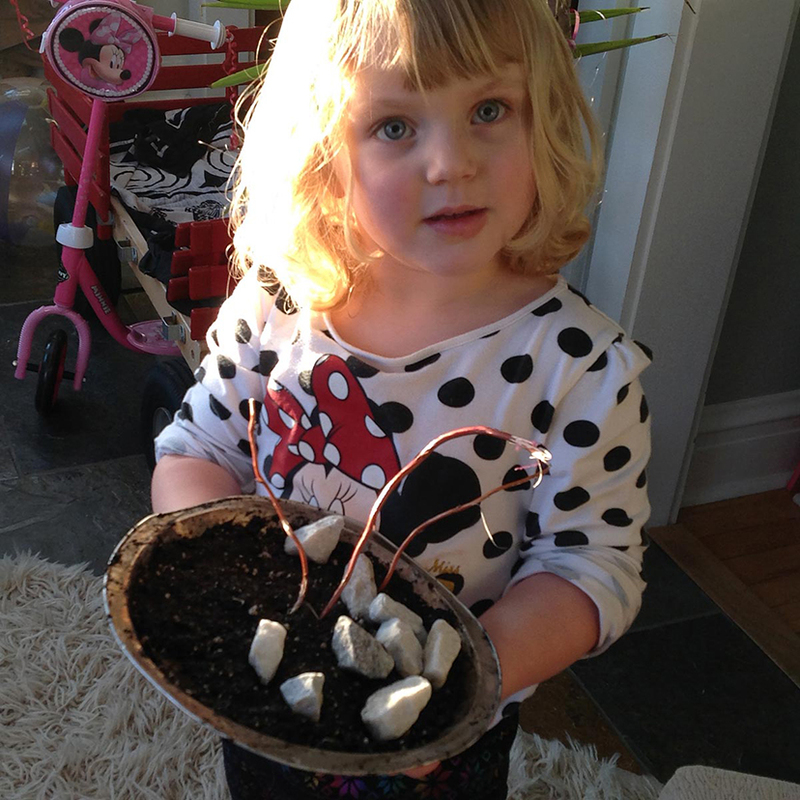 Learn about our Nature Preschool program.